The Southwest Franklin County Historical Society, Inc. The mission of the Southwest Franklin County Historical Society (SWFCHS) is to bring together people interested in the history of southwestern Franklin County. Understanding our community’s history is basic to our way of life, gives us a better understanding of our state and nation, and promotes a better appreciation of our American heritage. The society’s major function is to discover and collect information, artifacts and materials that may establish or illustrate the history of our area. Our long-term goals include detailing the history of Grove City, identifying area historic sites and developing Century Village’s historical structures. Visit the Southwest Franklin County Historical Society website. Local history is further preserved at the Grove City Welcome Center and Museum, 3378 Park Street, in the historic Grove City Town Center. The museum, open weekdays and Saturdays on special occasions, houses artifacts and information on the history of the area. Southwest Franklin County Historical Society maintains rotating historic exhibits. The Grove City Welcome Center and Museum showcases life in southwest Franklin County as it transformed from a farming community into a flourishing suburb. Visitors discover how the families who moved here lived, worked and established a thriving small-town community. Tuesday, 10 a.m. to 8 p.m. The oldest items on display are the 1853 baptismal dress of the first child born in the Village of Grove City and a civil-war era, wooden suitcase. Examine the many household items including a washing machine from 1896, sewing machine from 1920, Victrola which still plays 78 records, rotary dial telephones from the 1940s; and a 1930s, 16mm projector. Reminisce while viewing the photographs of Grove City churches, businesses, churches, events and residents through the years. Museum staff will collect, protect, preserve and do our best to research the artifacts, documents and photographs that trace the rich history of Grove City and surrounding area through exhibits and historical research. We hold the pieces in our collection in trust for present and future generations. We are eager to display historical items either as a temporary loan to the museum, or you may donate your items (all donations are tax-deductible). Photographs and paper items may be brought in for us to digitally scan, then you can keep the originals! For more information on how you can be a part of the Grove City Museum, call 614-277-3061 or stop by the Museum at 3378 Park Street. We’d love to hear from you! The Southwest Franklin County Historically Society meets the first Tuesday of each month at 7 p.m., St. John’s Lutheran Church, 3220 Columbus St., Grove City. For information regarding the Southwest Franklin County Historical Society, contact Steve Jackson 614-871-0081. Visit the Grove City calendar for the Southwest Franklin County Historical Society meetings, events and activities. Group tours of Century Village, the Grove City Museum or historical downtown Grove City are available. Contact Bev Babbert at 614-875-9787. For group tours of the Grant-Sawyer Home, contact the Grove City Museum at 614-277-3061. Tours for school children, groups, family groups and clubs. Century Village at Fryer Park, 4185 Orders Road, represents life in an emerging central Ohio community during the mid-1800s through the display of buildings and artifacts characteristic of the times. This cooperative, developing effort of the City of Grove City and the Southwest Franklin County Historical Society is home to a number of relocated and reconstructed historic structures, as well as a schoolhouse original to the site. In 1879, the Orders family deeded an acre to the Jackson Township Board of Education for Schoolhouse No. 10 – “Orders Road School” – where three generations of students received their primary education before the district consolidated in 1928. The land was transferred to the City of Grove City in 1995. This log home was constructed by the William Kegg family between 1860 and 1880. In 1915, property was purchased by the Ruoffs then sold in 1960 to the Kientz Family. The house was dismantled with the help from Orient Correctional Institution inmates and rebuilt by SWFCHS and Grove City. Constructed on land owned by the Jones family in the 1850s, this barn was dismantled with help from Pickaway Correctional Institution inmates and reconstructed by SWFCHS volunteers and Grove City. Windmills harnessed wind power to pump water from wells freeing farmers to work on other tasks. This example is reconstructed with parts from two separate windmills. This type of outside toilet was used before more hygienic methods of wastewater disposal such as sanitary sewers. Once located on a 203-acre farm, this house constructed by the Haines family prior to 1850 was occupied by the Black family from 1935 until the 1990s. Crib barns are multifunctional structures made of rough-hewn logs notched and laid horizontally. The unfilled gaps saved labor and provided ventilation. They sheltered livestock, held feed, stored equipment, housed workshops and more. Original to Perry County, this barn was dismantled and stored before being purchased and reconstructed by the Bob Evans Farm. They donated it to SWFCHS and Grove City. Blacksmiths were central figures in a growing community. This shop was constructed using original logs from a two-story log home built on Beatty Road in the 1850s and furnished with tools used in Earl F. Augenstein’s Blacksmith Shop on Orders Road, 1952-1997. This small granary was built on the Ziegenspect Farm, on Harrisburg Pike just South of St. Rt. 665, around 1927. The granary was used to dry seeds for the family to use the following season’s crops. Steve Funk purchased the farm in 2003, donating the granary to the Southwest Franklin County Historical Society and the City of Grove City in 2014. The Southwest Franklin County Historical Society and the City of Grove City want to thank Dow AgroSciences LLC and Columbus Pest Control, Inc. for help in protecting the historical buildings of Century Village from termite attack. Dow AgroSciences generously has donated Sentricon® Termite Colony Elimination System with Always Active™ technology, and Columbus Pest Control, Inc. generously has provided system services. The Grant-Sawyer Home, 4126 Haughn Road. 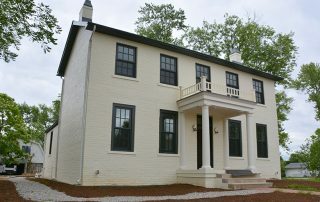 Grant-Sawyer Home Tours Tuesday, Thursday or Saturday, 10 a.m.-2 p.m.